We left you last in Paris, where upon check-in at a fancy American hotel, we were immediately and effusively welcomed by the guest relations manager, and showered with free drink and breakfast coupons worth about a hundred bucks. I wondered for a little while, because although I like them very much, I don’t usually stay at this chain. And I was using points. Ergo, I expected our treatment to be friendly, but not overly enthusiastic. And then I looked over at Charley. 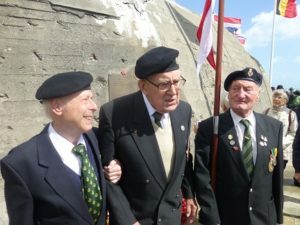 He was still wearing his blazer with his Afrika Korps and Sherwood Ranger pins, and a pin commemorating attendance at the 70th D-Day celebrations. His tank beret was set at a rakish angle, with a Sherwood Rangers emblem clearly visible on it. The staff never asked if Charley were a veteran, and we had not said anything. Although we did sort of mention that we had just come from Normandy, and were late checking in due to the bothersome traffic. I happen to feel that Charley should be treated with the highest respect as a WW2 veteran who fought honorably, and who has spent his life working for peace and reconciliation. But I wasn’t so sure the French, who didn’t know his mission, would recognize that as quickly if he burst out speaking German, as sometimes happens. In the elevator, I suggested Charley might want to consider speaking English in public areas, since staff seem to have been alerted to his status. Since we were more than a little tuckered out after the long day, this was a tough task indeed. Despite his best efforts, a slipped “Ja Wohl!” on his part inevitably produced a little jab on my part, and a forlorn sigh. But we pressed on, and went to the unbearably chic Sky Bar up at the top of the hotel, ordering a hot chocolate and virgin pina colada. Our French waiter jutted his chin and emitted a practiced, nearly inaudible snort when we paid the $50 tab with our coupon. But our view of the nearby Eiffel Tower in the delicate hues of the rosy setting sun helped us quickly change our focus. The next morning after our enjoyable, free breakfast, we hired a taxi driver to take us around the corner to the Arc de Triomphe, and then over to the Eiffel Tower for a few snapshots. Then we checked out, packed up the car with our considerable luggage and gear, and climbed in. I set a course in our GPS and started driving, while it searched for satellite reception. In true French fashion, however, it decided to strike, recalculating endlessly. After 20 minutes of an unintended tour of Paris, I broke out my iPhone, and with its help we made our way to a clogged freeway and slowly out of the city. We arrived in a very peaceful Verdun, and stayed with another Dutch couple in the German/American sector. Their beautifully restored farmhouse was the perfect home base. The next day we picked up our guide Maarten for another fascinating day of 1870 battlefield tours in Sedan. After a lovely evening meal and huge Dutch breakfast the next morning, both provided by our hosts, we headed off towards Germany and our last 1870 destination: St. Privat. In the days of our scouring 1870 battlefields, we had always sought a Saxon monument, but had not found one yet. As there was no united Germany until after the victory in 1871, each of the German armies had been regional, and Charley’s grandfather had fought in the Saxon army. Finally, on this last day in France, in the last town, and at the last monument, we found a bombastic Saxon stone, just outside the unchanged fields where the battle raged 144 years ago. Charley’s joy in this type of moment can only be described as profoundly moving. 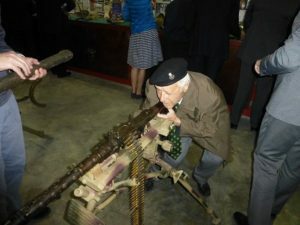 As a little boy, Charley had learned absolute respect for his father and grandfather and their service in the wars. This deep sentiment, coupled with a desire to honor and match their courage, had been the core of his personal drive to serve. Because he cannot travel long distances alone anymore, and there hasn’t been much interest in the following generations in learning about this history or following this tradition, Charley never dreamed he’d be able to find or see or touch this stone, this slender and rare and tangible connection to his esteemed grandfather. The fact that we could do this before he leaves this earth affected him more profoundly than I, at half his age, can probably really truly comprehend. But having been deprived of my own adored father for nigh on ten years now, helping Charley experience this joy is not a completely selfless task on my part. And I remember that my own great-great-grandfather came from Prussia to America in the 1870’s. So this link, this connection, and this mystery of love of our ancestors belongs not only to Charley, but to us both. There are few things in life that provide such a high return of happiness for so little investment in time, effort, and money. We’ll enjoy them while we can. Next up: visiting the widow of a rocket ship driver. At last, I’m grabbing just a few minutes to update you on some of the highlights of our current doings. I arrived in Frankfurt on Tuesday. Charley, intrepid 90-year-old world traveler, took the train down from Hamburg on his own and met me there. The real adventure, though, started in Gravelotte, France, near Metz, where Charley’s grandfather fought in the 1870 Franco-Prussian war. Imagine travelling with an American WW2 veteran whose grandfather had fought in the Civil War. It’s mindboggling to me that through Charley there is some kind of intimate connection to 1870. The Franco-Prussian war, which produced the highest known number of casualties of any European war up to that date (so they say here), was horrific in its use of the newly-developed Gatling-type machine gun versus infantry and cavalry. (That anyone ever used cavalry on the field of battle in WWI and even WW2 should be recognized as a crime.) Surprisingly, the many German memorials that dot the landscape near Gravelotte are in fantastic shape. One can spend hours, even days, discovering dozens of marble and granite works of art and graves tucked in fields and along dirt roads in rural areas that haven’t changed much since 1870. Eventually I wondered why there were no French memorials. After all, this is French land. But the victor always writes history, and this was a big German win, after which parts of Alsace-Lorraine then became German territory. The newly-minted, very modern museum in Gravelotte works hard to pull this war out of the obscurity it fell into after World War I. It has a very harsh lesson to teach. Without the tremendous victory obtained by the Germans, the bitter occupation of French territory might not have been a basis for seeking revenge in World War I via the Versailles Treaty. And without the draconian conditions of the Versailles Treaty, including the unpleasant French occupation of German territory, World War II might have been a very different story as well. 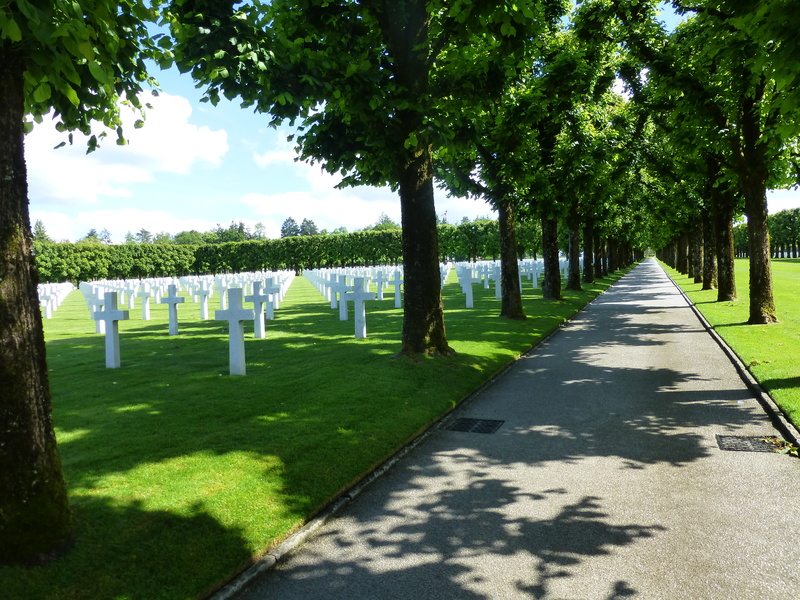 There was not much time for reflection before our schedule pushed us along ever closer to Normandy and D-Day, my much-dreaded, and Charley’s much-anticipated goal of our trip across France. Moving through time 48 years, and by land a couple hundred kilometers, we landed in the American sector of fighting in WWI near Verdun. In a small village called Nantillois, a young Dutch couple hosted us at their charming Bed and Breakfast. The next day Maarten gave us a guided tour of the area and his private collection of WWI artifacts. 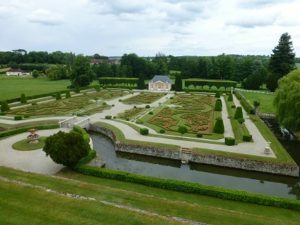 He explained to us that Nantillois had been occupied by the Germans for the entire four years of the war until the Americans arrived. In 47 days of combat, our fresh and inexperienced boys pushed the exhausted but still formidable Germans back in this sector and helped ensure a victory for the Allies. It came at a very high cost, however, as the enormous American Meuse-Argonne cemetery in this lonely rural area can attest to. After a tour of the Argonne Forest, strategic springs, forts, battlefields, and monuments, Maarten brought us to this immaculate and most lovely cemetery in the early evening. As he told us the story of an African-American who won the Medal of Honor for heroic deeds carried out in 1918, Taps was bugled through the loud speaker, with no warning at all. Caught completely off guard, tears involuntarily welled in my eyes. Dammit. Once they started, our visit to the chapel didn’t help, and the ringing chimes of the Star-Spangled Banner were my utter undoing. The next morning – D-Day – June 6 – brought our departure and journey another 22 years forward in history and hundreds of kilometers to Compiegne, where the armistices of 1918 (German surrender) and 1940 (French surrender) were signed. After a quick lunch with our dear French historian friend Dominique Lecomte, we pushed onwards to visit the grave of German fighter ace Egon Mayer in the cemetery near Caen. It took some time, even for me, to get used to the thought of laying flowers on the grave of the man who had shot down Bob Sweatt and killed so many Americans on January 7, 1944. But in the end, Charley’s mission of peace and reconciliation, constantly demonstrated, reminded me that each of these boys was fighting for his country and had had a job to do. In March, 1944, at the age of 26, Egon’s life ended when he was shot down by an American Thunderbolt pilot’s lucky deflection shot at 1,000 yards. He left behind a wife and a young daughter who would never know her father. Finally, through agonizing gridlock and after countless routine near-collisions, we arrived at our over-priced hotel in Caen, the closest we could get to the D-Day activities. Up early on the 7th, we drove to the parking lot of the museum in Bayeux where we shared chocolate croissants with British friends, and grandchildren of Ken Ewing, one of Charley’s best friends after the war. It was Ken who had invited Charley to meet the Sherwood Rangers in France for the first time 25 years ago, and since then his children and grandchildren, and the Sherwood Rangers themselves, have become as close as family to Charley. Standing out in the rain with our 90-year-old after our breakfast, we peered in through the museum’s locked glass doors as the French impassively looked out at us. Mind you, Charley, be he wet, cold, hungry, tired, or in pain, never complains when we travel. It’s me who starts tossing my hair and flaring my nostrils. I did a bit of it then, especially when opening time came and went, to no avail. The French will open their doors when they are good and ready, and not a moment before. In any case, they finally did. Soon thereafter the Sherwoods arrived in their coach, the sun burst out, everyone visited the soggy British cemetery across the street, and the ceremony for the liberators ran its usual course. Over ham sandwiches afterwards, we visited with our Sherwood friends. It was only a short time before we sadly had to leave for an important engagement with our French friend Arnaud Theron. Our attempt, however, to meet him in a timely manner at the American cemetery was thwarted by several thousand cars, restored American jeeps driven by re-enactors, and lines of buses that extended at a near standstill for the last three kilometers between us and Omaha Beach. Arriving very late, we negotiated the large crowds to lay flowers at the graves of Bob Sweatt’s crew buried here. Because I am so used to the ridiculous number of rude gawkers and sensation seekers at this time of year in Normandy, it almost didn’t bother me that there were 5-15 strangers at every grave impolitely taking pictures and videos as we quietly laid the flowers for the crew. Arnaud brought some French history teachers who were honored to help us lay the flowers, and thrilled to meet Charley. After we had spent some silent time at each grave, we sat on the stone wall overlooking Omaha Beach while Charley answered their questions. It didn’t take long before Charley, who stands barely higher than 5 foot nothing, started to feel the afternoon heat while dressed in his woolen pants, tie, beret, and blazer. He was in strong need of water, and so we slowly walked back to the car, before extending fond farewells. We had many lovely, heartfelt moments with our French and British friends, who were so kind, honorable, open, and caring. Despite the late hour, and his fatigue, upon our arrival hours later in Paris, Charley could barely sleep for his excitement and joy of the day. So despite the substantial difficulties that the date and location engendered, I can consider our mission for this leg of the journey well accomplished. Do you believe some people are heaven-sent? After meeting many French angels in the last week, I’m a believer. First, Dominique. I told you about a little about him in my last email. We went to several “helpers”, young women (at the time) in Brittany who sheltered airmen in their houses at the great risk of torture and execution. Dominique interviewed them in French. I filmed. These ladies already knew and trusted him as well, and so shared secrets and details that they would not have with anyone else. Giving up his chance to vote in the French parliamentary elections, Dominique took me to Paris where we interviewed a man who had taken airmen on the train from Paris out to Brittany, including Robert Sweatt and five others on the train in March, 1944. After our interview I followed Dominique to his home near Creil where I met his family. Creil just happens to be where JG2 (the Richthofen squadron) was stationed when they went up in the air to shoot Robert and the others down. JG2 was a very, very busy unit. Of course the area is littered with planes they shot down which were never recovered. At noon the next day, I had to go. Three hours later I arrived south of Paris, to the place where Robert and Trouble, his plane, crashed. After retracing his route while trying to escape the German cordon set up to ensnare him I gained a far better insight into the real miracle that allowed him to endure until he was spirited to a local farm. Leaving one small village for another in the Orleans forest in the fading light, I arrived at the home of a local historian had been on the phone for days (really, FIVE whole days), arranging everything for my visit. We had dinner at 10 pm, and he could barely sit down he was so excited to see me, showing me his research, giving me books he had written on the other planes that had crashed in his area on January 7, 1944. His wife had made almost all the food we ate by hand, including a certain type of lemonade drink with grapes and other fruit, and had gone to a neighbor’s garden to pick fresh strawberries for dessert. In the morning, we quickly got ready. 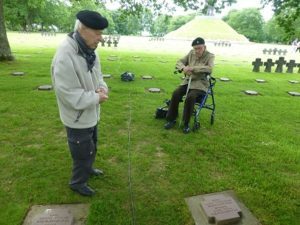 My historian friend had arranged a “little” ceremony at the memorial for one of the planes. When we pulled about, about 20 cars were parked on the side of the road, with more pouring in all the time. Two journalists started interviewing me. Humbly, I told them I was just a researcher. To them it didn’t matter. 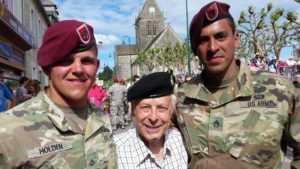 I was American, and they would do anything to make sure I understood how grateful they are to the airmen who helped liberate them and their village. The rain held off as some of the eyewitnesses to the crash explained what happened and how gruesomely some of the aviators had died. Then I and the head of the local French-American association placed a beautiful bouquet of flowers on the memorial as ten flag holders stood at attention behind the memorial in a semi-circle. I met the mayors of some of the nearby villages, and after they spoke, I was asked to say a few words. In my schoolgirl French I thanked the people present from the bottom of my heart for remembering our boys, and for honoring them in this way. But how can words really convey how touching, how utterly moving such an effort by the local people was? Afterwards, we tromped deep into the soaking woods to see where the B-24 had crashed here. Then we went on to where some of those with parachutes had landed. More memorials, more eyewitness accounts, a speech from the mayor, pictures for the journalists, and then onto the next little town, where yet another B-24 had crashed January 7 (JG2 shot down 5 in this area). There we ventured even deeper into the woods, down country lanes and over rough ground to find the crash site. Finally, at noon, about twenty of us ended up miles deep in the Orleans forest, over hunting trails on private land, at a memorial to a band of Maquis who had been encircled and wiped out by the Germans. At the bottom of the plaque was the name of one aviator; an aviator lucky enough to bail out with a parachute, but unlucky enough to be caught in some trees and not found until 18 days later, dead. Agonizingly, I could not get the thought of him hanging there out of my mind. Again, I had to cut our visit painfully short in order to go on to Germany to interview a JG2 pilot. I promised, however, over and over, that I would come back. And I mean it. I don’t at all deserve all the hospitality of these wonderful French people, to be the recipient of their gratitude towards the Americans. To all my American WW2 veterans and friends who truly earned this honor and respect, my eternal gratitude. 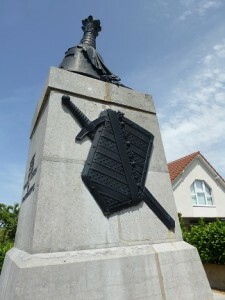 Yesterday was the celebration of the liberation of the first big town in Normandy – Bayeux. And the liberators? The Sherwood Rangers, of course – those same fine British gentlemen I interviewed last month in England. You remember! The ones who fought in Africa against my friend Charley but who are now the best of friends with him. 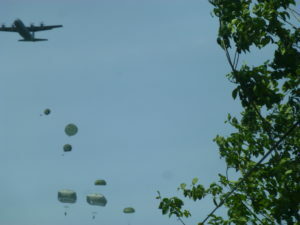 Normandy, helped close the Falaise gap, then supported the 82nd and 101st Airborne Divisions in Holland. They were the first British armored unit through the Sigfried line into Germany. They were certainly the popular ones (with Allied infantry – if not the opposition). 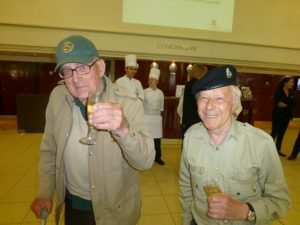 Yesterday, three of these great Sherwood fighters came to partake of the celebration held in their honor in Bayeux, and I had the great pleasure of continuing my conversation with Graham Stevenson. fire. The bullets ripped through his brachial artery, missing his chest narrowly. Soft-spoken, modest and sweet, Graham was a tall lad who had convinced the army he was old enough to join, when he wasn’t even close. Only 17 when he fought in Africa, Graham was a seasoned 19-year-old combat veteran when his wound in Normandy took him out of the war for good. It was hard to have only a couple of hours with Graham and the others and then to have to leave them in a rush. I delayed my departure and then finally had to go. As I drove towards Brittany I travelled through the cities they had fought bitterly to liberate after Bayeux – Tilly Sur Seulles and Villers-Bocage – and in each of the places I was very sad that I could not have them with me there. forces was just ending when I arrived, but it was not too late to meet Dominique – a French researcher who knows some of the remaining Resistants. generously conducted the interview in French, grace a Dieu! Truly, I owe a tremendous debt of gratitude to Dominique, possessed of a good nature, and an immense desire to help others. Here is the true nobility of the French. There are always breaks for enormous meals with new a whole mishmash of French, American and British friends, and spectacular views of gorgeous, uncrowded (and somewhat freezing) Breton beaches. Despite the cold, wind, and a serious lack of what Graham calls “bijou” lodging, because of the wonderful hospitality of our French hosts, things couldn’t be going better.